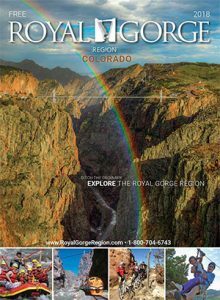 The Royal Gorge Area is at the center of many mountain and road biking trails. Trailheads are easily accessible from Highway 50 and can also be found along the scenic Gold Belt Tour (some of these roads may require four-wheel drive). One of the most popular areas to mountain bike is Red Canyon Park, where you can enjoy the scenery as you pedal through gorgeous sandstone rock and spires. Fremont Adventure Recreation (FAR) has created maps with descriptions and directions to the following trailheads. For more detailed maps, descriptions, and directions, check out FAR’s Adventure Guide. Section 13 is a moderate singletrack trail for novice and intermediate riders through the junipers and pinons at the base of the Wet Mountains. Chops takes you through the lower loop, touring more open terrain, while the section called Hotshots offers a slightly more technical and steep experience through denser trees. It’s about six miles total roundtrip with an elevation gain of 700 feet to the top of Hotshots. Section 13 is great because it’s close to town with great views of Canon City and Pikes Peak as you ride alongside deer, wild turkey, and other native wildlife. Oil Well Flats is a collection of moderate singletrack trails for the intermediate rider. This trail takes the rider through junipers, pinons, and open areas caused by a 1988 fire. Several dirt roads run through the area and connect sections of singletrack trail. It’s about seven miles roundtrip on the newer singletrack. 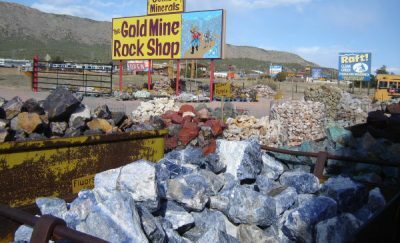 The Oil Well Flats trails are close to Canon City with great views of the city and the Sangre de Cristo Mountains to the southwest. The Canon City Hogbacks offer fun, roller-coaster style riding with easy-to-moderate climbs and descents. Ride up “Old Skyline Drive” for a more difficult and technical experience or ride the double-track on the east side of the open space for an easy spree through the area. Skyline Drive also makes a nice pavement option. It’s about four miles for a straight out and back ride. The Hogbacks are awesome because they offer wonderful roller coasters (best from north to south) and a unique geologic experience. See our Hogbacks Trail Guide for all accessible trailheads. This is a high quality out and back road ride, heading north from Canon City and taking you past the Red Canyon Park. The ride is 28 miles roundtrip with 1,100 feet elevation gain. The ride can easily be shortened by turning around whenever you need. This is a scenic ride that is light on traffic. The Arkansas Riverwalk Trail is an easy path that follows the Arkansas River through Canon City. It is a very popular trail, so expect to encounter others, especially on nice days. It is 7 miles one-way with 200 feet of climbing from east to west. This is a novice trail great for families. Tunnel Drive offers the ease of a recreational path with sweeping vistas of the Royal Gorge. It’s just two miles one-way, so it’s perfect for families. Look up for views of the beautiful cliffs and foothills and enjoy going through the tunnels at the beginning of the drive. Opened in the spring of 2017, the South Cañon Trail System adds ten miles of singletrack to Cañon City’s growing trail system. 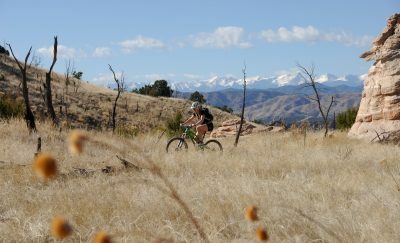 The South Cañon Trail System connects to the Section 13 trails and offers something for everyone. Discover flowy, easier trails close to town or try to master the technical climb of Hard Time. Since the Eagle Wing Trailhead isn’t very large, we recommend cyclists riding from town park at/near Centennial Park. In addition to these trails, Canon City has a pump track located just east of the Train Depot and alongside the Riverwalk Trail. The pump track is Canon City’s newest addition for bicycle lovers and offers a great place to hone your skills.